After years of third-stringing it, Sony's beleaguered PS3 may finally be rallying, according to sales data cited on Sony's US PlayStation blog. The company's American division reports year-over-year October hardware sales lifted nearly 70 percent, and says its online PlayStation storefront clinched record revenues, with downloads up 60 percent over the same period last year. SCEA claims some 650 million pieces of content have been downloaded worldwide, though--just weighing in here--that's really more of a talking point figure, since it mixes 'free' with 'paid-for' content. It's one of these 'dazzling' numbers arrived at by jackhammering a slab of data into the tiniest possible fragments, a bit like claiming the PSP Go has '16,000 pieces of downloadable content'--technically accurate, but mostly comprised of the 13,300 individual TV episodes available. The more salient sum would be '31 million', which is how many registered PSN accounts Sony's laying claim to globally (the company says 5.4 million of those sign on every day). Even that number's a bit misleading, however, since a snap look at Sony's global PS3 sales reveals there aren't that many systems in the wild. How to account for the overage? Factor the PSP, Sony's PlayStation portable, which plugs into the same online service. Sony's moved over 50 million PSPs to date, so if we scribble down a rough global estimate of around 80 million PS3s and PSPs combined, '31 million registered accounts' amounts to slightly more than one-third of the total online PlayStation brand. How many belong to either platform is down to guesstimating, since allocation percentiles are unknown. By comparison, Microsoft claims "more than 20 million" Xbox LIVE members, but can also count "Gold" membership revenue (an undisclosed percent of total LIVE membership). Both companies make money on content downloads, but only Microsoft's collecting dollars at the gate. 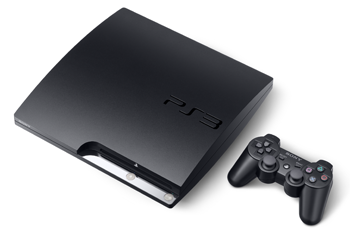 SCEA says its year-over-year PS3 uplift makes it "the only console to experience significant growth year over year." That's true, but it riffs on the system's acutely sluggish performance for most of 2008. Contrast with NPD's monthly reminders that Microsoft's Xbox 360 was the only system to experience year-to-date gains during the six-month slump that preceded recent game biz rebounds. Sony's doing well, in other words, but--no surprises here--how well has to do with what you emphasize (or in this case de-emphasize). Sony continues to focus on year-over-year growth, while Microsoft highlights year-to-date resiliency. In actuality, it's impossible to say who's outperforming whom, since hardware costs, online software sales, brand totals, and demographic specifics are kept tightly under wraps.